In Moodle 3, you can access VoiceThread, which is a module that enables interactive video chat sessions with other people. It allows you to upload and present files and media, and even draw on the media you are presenting in real time. 1. Open your VoiceThread activity. 2. When VoiceThread loads, Home is the default page it will start with. In the Home page, you are able to view a list of your VoiceThreads, search for other VoiceThreads, access your account settings and help pages, and view your recent activity. 3. To search for a VoiceThread, type your search terms into the light grey text box at the top left of the module. 4. To view your recent activity, click the Numbered Icon in front of your account email address near the top right, and your recent activity will appear in a dropdown menu. 5. 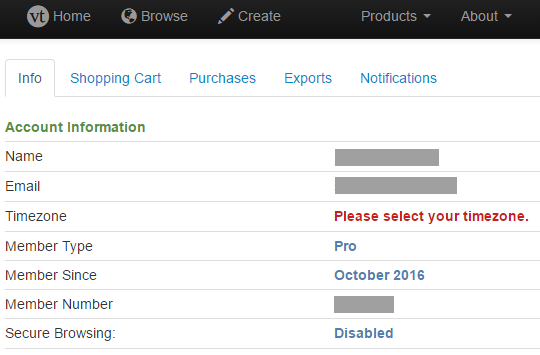 To access your account settings and preferences, click your account email address at the top right corner of the module, then select any option from the menu. The menu options are listed below. My Account: This will open a new window which will take you to the VoiceThread account details on file for you at LSU. My Identities: This allows you to edit your account's display name and picture to be different from your login account, and you may make as many saved identities as you want. Display Preferences: This will allow you to set your display options to use a light or dark background theme, set your language, or enable a screen reader. 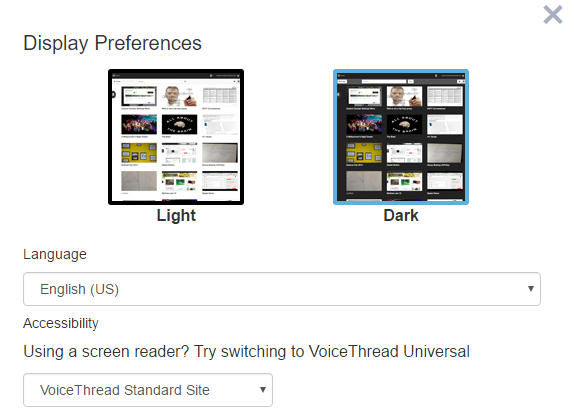 ThreadBoxes: This will take you to a page where you can organize your VoiceThreads into groups called ThreadBoxes. Groups and Contacts: This option allows you to add members to your contacts and to groups. Sign Out: This action will log you out of VoiceThread. 6. To access help, click the blue Help tab at the right side of the module.